One report for each [Main demographic]. For surveys over multiple time periods, this report shows the change of each rating and number question from one period to the next as a chart and table. 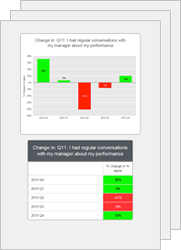 Useful for tracking the change over time in any value question, including NPS. The frequency and range of data can be varied using the Timeframe button.